Check out the Coastal Life and Design Blog for a great write up about Artists Houses. Thankyou and what a delicious treat is the Artists' Cottage, our home away from home. We look forward to saying in the future. Adam and Emma. This is a great house for a family - or multi-family - holiday. 100m to Four Mile Beach, great walks and swims, Port Douglas town and the Marina a 5 min drive away. The house has a pool, and lots of private spaces and communal spaces - indoor and outdoor - for everyone to do their own thing, or come together. There's stovetop espresso or plunger for coffee, fans and great airflow throughout the house, and great notes provided about things to do in the local area. There's a washer, tumble dryer and washing line. The house is situated in a whisper quiet area so there's real relaxation to be found, along with walks / swims up and down Four Mile Beach - really, there's nothing better. This house, and Tina the host, come highly recommended. Tim and his family had a great time at the Artists' Treehouse. 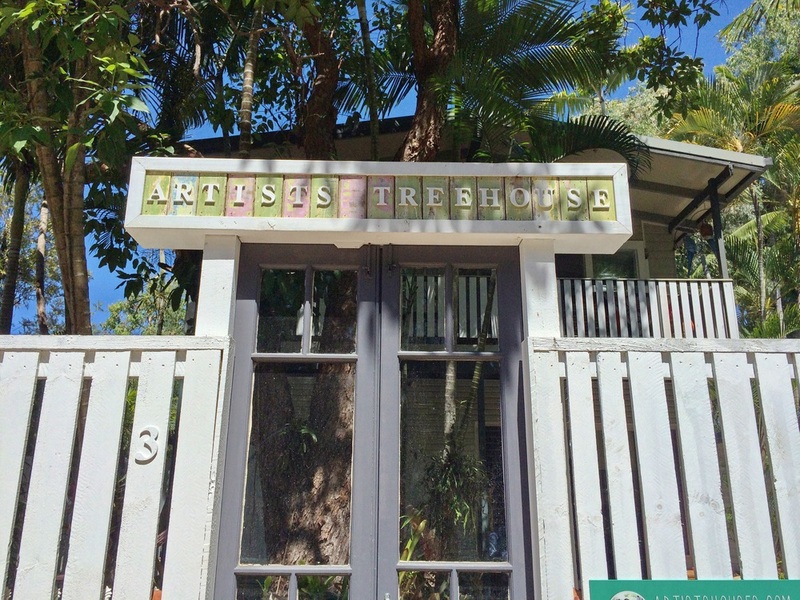 "We all had a fantastic time at the artists treehouse. We loved the location within walking distance of the restaurants, the open feel to the house, the tree (with active birds nest) so close to the balcony and access to the shared pool. Each time you walked around the house you found another piece of art to enjoy you hadn't noticed before. 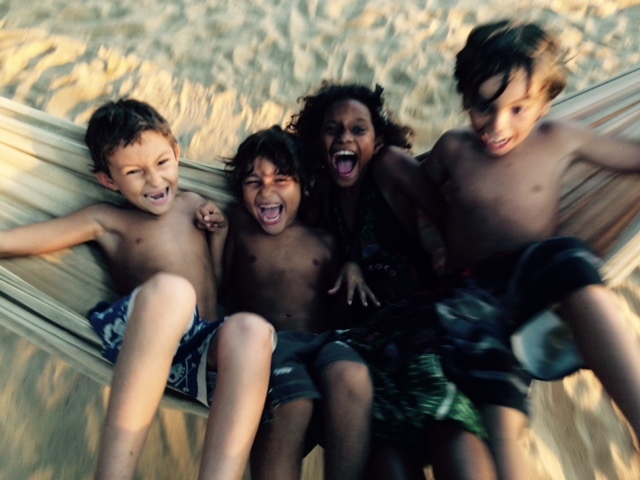 Tina and Husband met us on arrival and seemed like a great family with a real lust for life. All round great experience." Sue and her family just had a great time at the Artists' Beach House: "We had the most amazing week at the Artist's beach house in Port Douglas. We used the house as our base to explore the area. The house is in a great location, short walk to the beach and a quick drive to shops, restaurants and coffee shops. The swimming pool is wonderful and my children spent hours in it having fun with all the balls and boogie boards that were at the house. There is also a good collection of books and toys. It is an incredibly relaxing and creative space and a week was definitely not long enough - we were all sad to pack up and leave. Tina and Matt were great hosts and popped in to make sure everything was okay. If you are looking for a great house to rent in tropical NQLD then this is the house for you!" Victoria had a great stay at the Berlin Artist Apartment: "The apartment was as lovely and the hosts made us feel very welcome. The location is superb and close to every amenity imaginable. Would gladly recommend the Artist Apartment." The artist apartment was fantastic. Brilliant location and a great space to spend a long weekend. Tina and her family were lovely and very accommodating sharing many suggestions for my time in Berlin. I'd definitely come back again. Tina and Matthew are warm, genuine and communicative hosts. Tina's response time to queries and texts was almost immediate, which gave us the confidence to book our stay at the beachouse. The beachouse exceeded our expectations as Tina's attention to detail is flawless. We literally arrived, unpacked our bags and hardly left the house for ten days only venturing out to stock up on food and supplies. The beachouse is vibrant and eclectic and has several nooks and hideouts. As a family we were able to spread out and chill and have space from each other, whilst remaining connected all at once. I think Tina and Matthew have created something rather unique here as this house has a soul of its own. Tina and Matt, what a beautiful, special place the Artists' Nook is. From the moment we walked in, we felt relaxed and at home. We loved it all and hope to take back the relaxed feelings with us to Sydney. The Nook is such an inspiring place. The books, and the art, such a wonderful mix, it's amazing how good it feels to be surrounded by beautiful things. We will be back one day. Julia had a great stay at the Artists' Nook "We've stayed in Port Douglas a couple of times before but always at hotels. Staying at the Artists Nook was so much more enjoyable. We loved all the attention to detail and you could tell that a lot of love had gone in to every part of the home. It's also a perfect location, close to the beach and the main street but lovely and peaceful especially at night. For the first time this year I slept without the help of medication. I'd highly recommend the Artists Nook and look forward to a return visit one day"
The Artists' Beach House is a great house for a family - or multi-family - holiday. 100m to Four Mile Beach, great walks and swims, Port Douglas town and the Marina a 5 min drive away. The house has a pool, and lots of private spaces and communal spaces - indoor and outdoor - for everyone to do their own thing, or come together. There's stovetop espresso or plunger for coffee, fans and great airflow throughout the house, and great notes provided about things to do in the local area. There's a washer, tumble dryer and washing line. The house is situated in a whisper quiet area so there's real relaxation to be found, along with walks / swims up and down Four Mile Beach - really, there's nothing better. This house, and Tina the host, come highly recommended. "The Nook went beyond our expectations. It imbued a sense of relaxation and calmness as soon as we stepped inside the door. The nook was light and airy ,with every space filled with beautiful art and wonderful books. We didn't want to leave and spent many sublime afternoons reading, swimming in the pool and playing one of the many board games that were provided. Tina and Matt were wonderful hosts and had provided everything we could possibly need in a holiday house. We miss it already ,its gorgeous cool polished concrete floors cool under our feet and the breeze coming though the house in the afternoon. A perfect location from the town and close enough to walk to the beach to catch the sunrise. Thankyou Matt and Tina for a wonderful holiday in a beautiful house"
The artists nook encourages all of the above – A fantastic oasis in the middle of port. Some favourite memories; fishing off the point each morning. Sitting a while in st. Mary's by the sea. Fabulous restaurants. Mossman gorge rainforest walks. Coffee and a good read at the local bookstore. Thank you Tina and Matt! A true port Douglas treasure. We have had the most beautiful and relaxing time at the artists treehouse. Such a great and inspiring space you have set up. The children absolutely loved it also. We will be back again soon to absorb the beautiful nature around these parts. Thanks again for all your insights, and great energy. We hope to see this place in the summer. Brett, Pete, read and indigo. Jo and Peter stayed at the artists' nook. "What a special place you have made. What a joy of a home to be part of. What an environment to ease into. What a space to expand from"